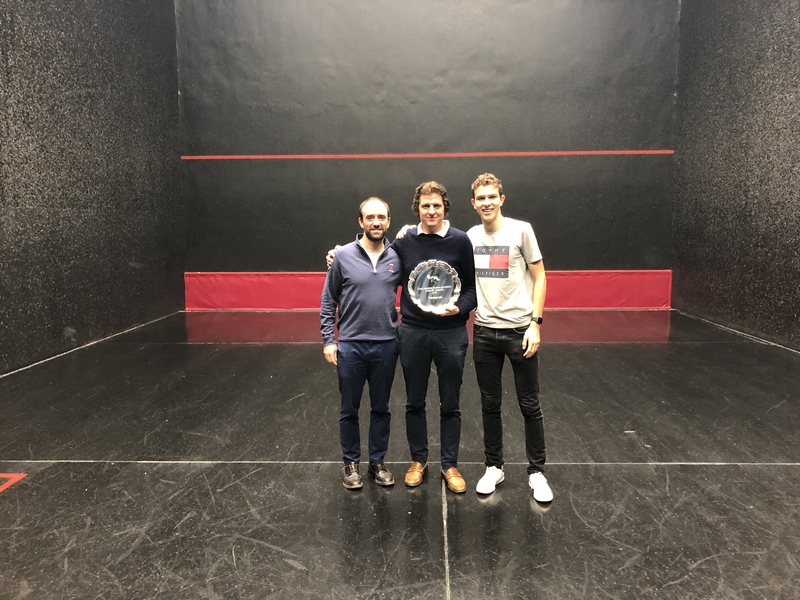 Following its first instalment last May, the NARA Under-35 Interclub Championship officially kicked off the 2018-2019 season with little pomp or circumstance at the Montreal Racket Club. MRC Pro Dan Fisher organized a loaded round robin schedule that saw each doubles pair play 6 matches throughout the tournament, a test of endurance for this mostly “out before the stag” crowd. With no black tie stag dinners or balls on the slate, the focus for all was clear: chase glory, on and off the court. And so began the tournament, with gallery cheering and mostly jeering, the sound of balls cracking against the four walls, propelled by both string and frame throughout. The legendary Montreal-Boston rivalry began the tournament, with each team’s A pair facing off against the B’s. Interestingly, Frazer Anderson, a true blue-and-gold-in-his-veins Montreal member played for the Boston side this weekend, adding some spice to these highly entertaining matches. Following the matches on Friday night, the group enjoyed pizza and copious libations in the club, and notions of rest before the next day’s matches were quickly dispelled. NARA has a reputation to uphold, after all, and this next generation of touring racketeers soldiered on to the wee hours at Kampai Garden, a venue that is certainly not unfamiliar to CanAm participants. Brian Rassel’s dance moves led the way for the group, while New York fellow Toby Calder saw fit to ditch the “old guys” in his quest for love. An especially foolish few gathered at Charles Vennat’s apartment after the bars stopped serving for some cleansing ales, dispersing only once they were well past their bedtimes. Saturday’s matches kicked off bright and early, though perhaps too early for some. A fresh-faced New York A squad, the strongest pair of the tournament, was on the court knocking up as poor Stephen Merwin tried to locate his partner. As readers of this screed will likely have guessed, the New York pair avoided the previous evening’s follies, while Mr. Merwin’s partner certainly did not. Unsuccessful, Stephen resorted to playing an exhibition match paired with Charles Vennat, host of the previous evening’s after-party. Readers can likely guess the outcome of that match, too. Despite the Curious Case of the Missing Bostonian, the tournament continued without a hitch. Tight matches were played throughout the day as participants alternated between naps, Bloody Caesars and furious rallies on the court. Short on sleep, all were fuelled by a good dose of club pride and, of course, the legendary Schwartz’s smoked meat sandwiches for lunch. Matches continued on until dinner as some of the boys left to pick up some last minute Halloween costumes, punctuated by a fantastic cocktail match between Steven Chamandy & Ben Belec vs Charles Buaron & Phil Stockton. The latter pair narrowly defeated the Montreal bunch in extra points, energizing the gallery in the process. This victory was enough to clinch the championship for the New York team, which saw its A pair go undefeated throughout the tournament. Saturday night’s Japanese themed dinner provided just enough of an excuse for the boys to decide that sake bombs would be an appropriate evening beverage, and the group certainly did consume its fair share of rice wine. Many even donned Asian robes purchased in Chinatown, further adding to the ambiance. Having consumed a wonderful meal with more than ample portions, the raconteurs stood and entertained the group. Frazer Anderson’s famously unsavoury jokes hit the mark to be sure, however even he was no match for Austin Marks, who drew both the lengthiest and loudest roars of laughter. Club Manager Robert Zietek must have been pleased when this well lubricated crowd finally headed out, costumed and all, to New City Gas to continue the festivities. Thanks to Steven Chamandy’s organizational prowess, the group was brought up to their table, adorned with every bottle of alcohol imaginable and surrounded by excellent company. The revelry continued until the wee hours, with the boys and their companions once again heading to Charles Vennat’s apartment for more cleansing ales. It should be noted that though the New York squad had already been crowned champions, the dedicated participants played their Sunday morning matches as if everything were still on the line. Given the previous night’s activities, this dogged determination is worthy of mention! Congratulation are in order to the champions of the Second Annual NARA Under-35 Interclub Championships from the New York Racquet & Tennis Club. In a popular vote, Charles Vennat was crowned the weekend’s MVP, and was assured that it had nothing to do with his performance on the court. Thank you to the MRC’s Robert Zietek and Dan Fisher for organizing a wonderful tournament, and to Charlie “George” Elmitt for his (questionable) marking efforts.